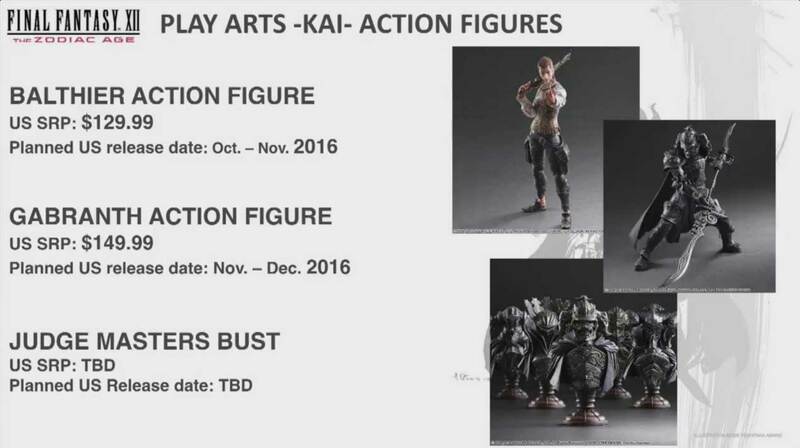 Along with the announcement of Final Fantasy XII: The Zodiac Age, Square Enix Merchandise has revealed some new Play Arts Kai and Static Arts Busts figures that will be released in the build-up to its release next year. Joining the Fran Play Arts Kai that released last year, will be a Balthier and Judge Gabranth. There will also be a new range of Static Arts Busts that will be modelled around the famous Judges. Yes, that's right, Judge Gabranth, Judge Ghis, Zargabaath, Judge Bergan and Judge Drace will all be featured. Balthier's new action figure will cost $129.99 and it's planned to release in the United States between October-November 2016. Judge Gabranth's new action figure will cost $149.99 and is planned to release in the United States between November-December 2016. Unfortunately, the new Archardian Judge busts currently have no planned release date, nor price. It's also unclear whether they will be sold separately or as a unit, but hopefully we will find out soon. How do you feel about these new figures, are you excited? The busts sure look awesome!